"To me, poetry is one of the highest, most abstract, most fulfilling forms of communication. We've always needed poets." In this recording from 1976, Patti Smith talks to journalist Mick Gold about censorship, her creative habits and inspirations, and recounts her first exposure to the poetry of Arthur Rimbaud. 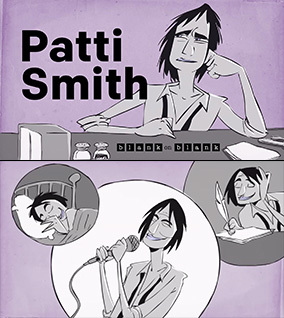 Animation director Patrick Smith is known for his hand-drawn interpretations of people, our emotions, and our identity. His films have been featured on MTV, PBS, FX, ESPN, ABC, Nickelodeon, and more. Currently, Smith and his studio are producing the fourth season of the PBS series Blank on Blank, an innovative show that illustrates rare audio interviews of famous artists, actors and musicians.